There’s only two weeks left until the calendar turns to September. So we put together a new giveaway to pass the time. With the approach of Labor Day, we know that many of you will be putting up your cool weather decorations for fall and harvest season. So we decided that Labor Day would be the perfect time to be shipping off a set of autumn decorations to one person’s home. Note: The pictured coffeemaker, pumpkin coffee and coffee cups are not a part of the giveaway. We love our coffee too much to give these away – Sorry! I wouldn’t say I necessarily have great Halloween decorations, but you can be assured they will go up earlier than anyone else’s on the block. Likely within the next week or so. I do a Nightmare Before Christmas theme for Hallloween!! This will be our first time having a house for halloween, so this will be our first time decorating. Im not sure how we will decorate yet. Just got a new house and need new decorations! These would look great!! This is beautiful, and OMGosh!! I can’t believe it’s almost fall already..This summer has gone by so fast! I dont decorate for halloween, I do however, put fall decorations out the first of sept. and they stay out till the day after thanksgiving, I have some beautiful pumpkins, and fall stuff. even a fall quilt I use! We decorate all together for fall and Halloween by using decorations that our kids made for us and store bought ones, like fall’s frame, leaves, pictures. It’s nice for us to keep our memories this way. My daughter’s B IRTHDAY IS ON HALLOWEEN.ALOT OF GHOST AND GOBLINS AND ALOT OF SCARY DECORATIONS MY GRANDKIDS LOVE SCARING THEIR MOM. With pumpkins and leaves and I have a collection of wooden people that I put out every year. They are dressed in fall clothing and I have some scarecrows. It’s so much fun. I just posted a vinyl on my door… but I go out and have fun. I have an awesome fall wreath I hang and we get lots of pumpkins! I change accessories like pillows but my real decorating is on the front porch where I put up a new wreath leaf garland pumpkins orange plants rugs etc. I love this time of year. I love to decorate for fall An Halloween fall time is mostly done with scare crows or pumpkins outside then inside with lots of decorations and Halloween more decorations inside then we put out but have light up items An carved pumpkins for outside!!!! Tombstones in the yard and pumpkins everywhere! I love to decorate with my kid’s art projects for the fall, lots of turkeys, pumpkins and leaves. I make decorations with the kids, we carve pumpkins, we buy decorations, we pretty much go all out. We have a blast with it! I decorate more for Fall then I do for Halloween, lot of Fall decor on the front door, in the windows. Love to decorate no matter what time of the year it is. Fall, to me, is the start of the holiday season. So that makes it even more exciting when fall is officially here. My twins love Halloween so we decorate our door and our front yard tree. Halloween is my favorite Holiday. My wedding day is Halloween so every year we decorate the house inside and out and have a costume party. I decorate for fall by crafting my decor using supplies I gather outside, like glittered acorns, fall wreaths with pine cones ect. I just bought a new house!! My husband and I are ecstatic to decorate it for Halloween! I think we’ll do pumpkins everywhere in the front yard and scarecrows. No idea on the inside yet! We might put up orange lights. We go all out for Halloween.. We decorate inside and out.. Props,Lights and animations. I love decorating with all the colors of fall especially with fall colored leaves! I love decorating with leaves and pinecones from outside, and of course pumpkins! We have a lot of fun we have a kiddos party we rake leaves and bag them we color all the bags, find pretty leaves and make homemade decorations with them, pick apples have them in baskets for everyone walking by, we bake we put grandpa corn stalks in bunches and its a whole lot of fun and so pretty love fall. I start on September 1st. 🙂 I use all kinds of fall themed items. I am always looking for new things. I don’t decorate for Halloween like I use to. Fall is my favorite time of year and I just love it. Everything stays up until December 1st. I love this time of year 🙂 Fall decorations, harvest times, and the start of the holidays. It’s the perfect time to prepare for a wonderful get-together with friends and families. I love the suggestions. Around Halloween we do some fun stuff for the grandchilren. Last year, we had them decorate these little skull heads. They were so cute. We usually do a hay bale scene too. I need more for the inside. 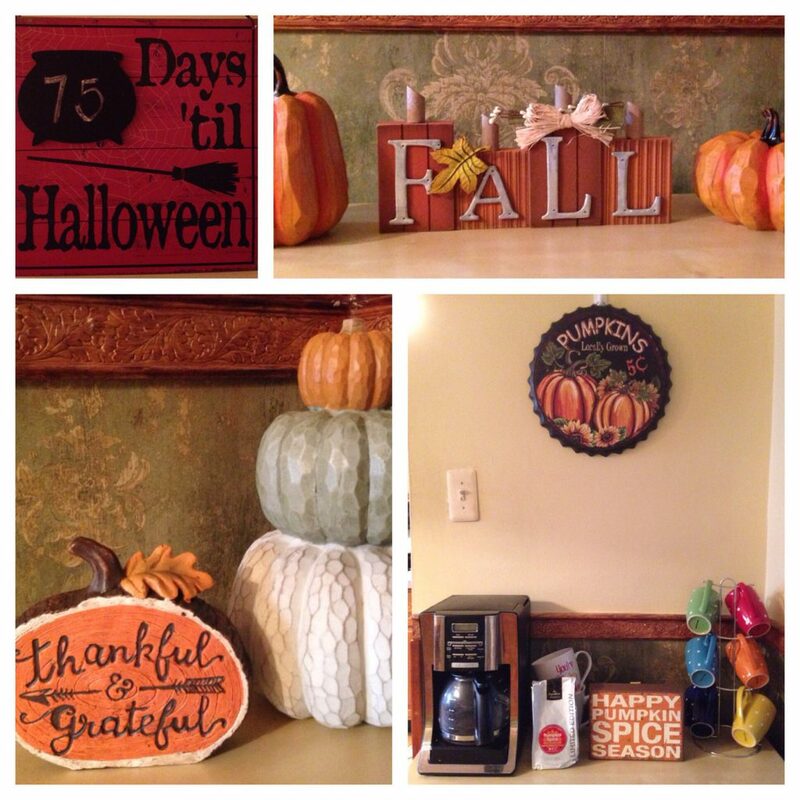 I love using fall colors around the house, plus a few gourds and pumpkins. I love putting decorations on our door and decorating the fireplace mantle! Fall colors are the best! I haven’t really decorated in the past but I should would like to start. I love seasonal decor and scents! My hubby goes all out scary! I love decorating with pumplins, goards, and leaves! I like funny looking pumpkins and black and purple coloring for Halloween. I get mini pumpkins and place them throughout our home. Th ebest part is I can keep them out until Thanksgiving. For the outside I have a sign that hangs and I get pumpkins for the porch. I love to decorate with wreaths on the door on the house and outdoor decorations.